How does Family Cow home delivery work? First create an account on this home delivery website (if you didn't already). Then go fill your shopping cart with your selection of any of our 100's of nutrient-dense immunity-building foods your body craves. When finished, be sure to complete the checkout process and we'll do the rest. We Pack and Ship: We'll carefully pack your special foods with special care in special insulated boxes and ship it via UPS to your doorstep. We ship every Monday. The order deadline is every Saturday. Your order should arrive safely in 1-3 days depending on your location. Do I need to create a separate account for home delivery if I already have an account for drop point ordering? Yes, you'll need a separate account for the home delivery service. But it's not complicated. In fact, to keep it easy, we recommend that you use the same name, email address and password for both. To which states do you offer home delivery? With our new UPS home delivery option we can deliver to residential or business addresses in 30 states in the eastern half of USA. But sorry; at this point we are not able to deliver to the western half of USA, Alaska or Hawaii. 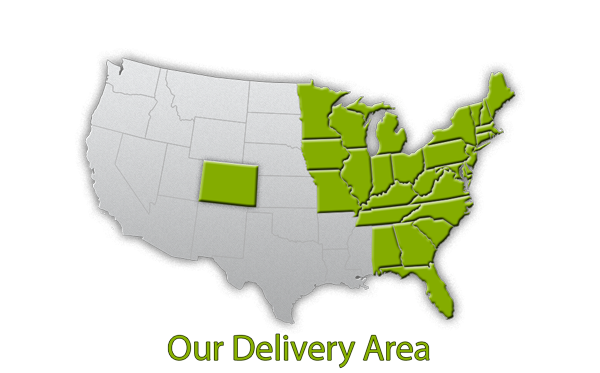 Check out our delivery zone map to see if your state is included. Can you ship raw milk outside of PA? But good news! We can sell our 100% raw cheeses, both cow and goat cheeses, to other states. So, yes, you can get raw dairy shipped out of state to your home... just not raw fluid milk. Why are some foods so much higher than the drop-point price? It's important to know that we did not raise our food prices at all. The short answer is that some items are more expensive to home deliver because all home delivery services bill by weight. For example: milk is heavy. One half gallon of milk weighs 4.3 pounds. With our drop point delivery, since we do that ourselves with our own trucks and drivers, we get to decide how to set the delivery charge. :) So... we intentionally go by % of the dollar value of the item rather than weight. That makes the milk much more affordable than if we figured delivery by the pound. And since raw milk is our flagship food... we do all we can to make it affordable. Does that make sense? If you explore around, you'll notice that anything heavy and relatively inexpensive per pound in our farm store... (goat milk, water kefir, cider, yogurt, raw milk, eggs) all seem expensive for home delivery. It's totally because of the weight factor. If we could get UPS and FedEx to bill by % of dollar value instead of weight, the prices would be much more in sync with the drop point prices. If I have an order already placed for a PA drop-point, can I just email or call you to get you to send it to my house instead? I'm sorry; I know that sounds like a really neat idea and an easy switch, but it is actually very complicated. The drop point ordering and delivery systems and the home delivery system are totally separate, so no, in order to avoid mass confusion we cannot switch delivery methods for you. But no worries; you can easily switch it yourself. To switch delivery methods, just send an email to cancel your original drop point order and then place a new replacement order for home delivery. As a rule of thumb, you can figure that one cubic foot of freezer space will hold approximately 20 lbs. of meat. Since our meats are variable weight, we'll not charge your card until your entire order has been packed and weighed. This is to make sure that you are correctly billed for the actual food that you received. Once your order is weighed and packed, we'll send you an email with a detailed receipt confirming your payment. Do I have to be home when the food arrives? Nope. UPS should leave the box outside your house if you are not home. From the UPS website: "Shipments that do not require a signature [ours do not require a signature] can be left in a safe place, out of sight and out of weather, at the driver's discretion." If I'm away for the day, will my food by okay till I get home? Absolutely. We package everything inside a two inch thick insulated box with ice packs / ice blankets so your food will remain nice and cold to the end of the delivery period. You are responsible to put the food into your freezer or refrigerator at the end of the day though. :) We can't promise it will stay cold on your porch for days if you procrastinate! Can I buy single items as I need them? Sure... you can... but we discourage it. That's why we have a $15 flat delivery fee for all orders under $100. Small packages are very inefficient to keep cold and end up being very costly for both of us. But hey... if you really need a few items and nothing else, and are willing to pay the $15 extra... go ahead. We understand. Am I required to commit for a certain amount of deliveries? Absolutely not. We very intentionally designed Family Cow home delivery to be the exact opposite of a subscription plan. We are aware that the commit-to-a-box-every-month business model is popular today in home delivered foods but we are suspicious that it's a plan to maximize the business profits, not to best please the customer. Our goal is to give you 100% freedom... to keep you in the driver's seat. You order what foods you want, when you want and how often you want. Of course, we hope that you are impressed enough by our remarkable health restoring foods that you'll order frequently... but that will be totally up to you. We are content to earn your trust and loyalty. If a food package in my order arrives damaged, what should I do? First, we try to be extremely careful in packing and we do use a box with over 30% thicker side walls as compared to most food shippers. This has advantages with holding the cold better but it also protects better against damage. But, in spite of all, damage still could happen if, for example, the delivery service drops a box from 4 feet up. So anyway, if damage has happened to your order, here is what you do. As soon as you notice the damage, send us a note. If you can, take a photo of the damage. Once we reply to your note, you'll be able to reply and attach photos. Photos are so helpful. They allow us to visualize what exactly went wrong. Maybe there is something we need to improve in packing. Or maybe it was totally a UPS problem. In that case, photos help us negotiate with UPS so they can reimburse us, since each package is insured by them against damage. Either way, rest assured that we'll make sure you are refunded, reimbursed, credited, shipped replacement food or whatever it takes to make it right. Also know that we'll hear you, we do care, and that we'll do everything in our power to keep damage from happening.